I have been diagnosed with cancer of the stomach. What should I do next? Stomach cancer is diagnosed by endoscopy. The diagnosis of cancer is confirmed by laboratory examination of biopsies taken at endoscopy. You should urgently see a specialist once you have been diagnosed with stomach cancer. NHS hospitals in the UK have a system by which all patients with stomach cancer cared for by a specialist multi-disciplinary team (MDT). The entire MDT will discuss your case in their regular meetings and will remain involved throughout your treatment. Most private hospitals in the UK will not have a stomach cancer MDT. If you are having treatment in a private hospital, your case will be discussed by the MDT in the local NHS hospital. For example, if you see Mr Sarela at the Nuffield Hospital Leeds or the Spire Hospital Leeds, he will discuss your case in the MDT meeting at St James’s University Hospital. What are the types of stomach cancer? The most common type of stomach cancer is called Adenocarcinoma. There are other types of stomach cancer called Neuroendocrine Carcinoma, Lymphoma and GIST (Gastro-Intestinal Stromal Tumour). These other types of cancer are rare as compared to adenocarcinoma. The treatment and prognosis are different for each of the four different types of stomach cancer. How can I understand the stage of stomach adenocarcinoma? The stage of adenocarcinoma depends on three parts. First, how deep does the tumour penetrate into the stomach wall? This is called the ‘T’ stage of the cancer. The T stage can be T1, T2, T3 or T4. The numbering indicates the layer of the stomach wall that is involved by the cancer. A T1 cancer involves only the innermost layers, called the mucosa and sub-mucosa. If the tumour extends into the muscle layer, it is called T2. If it goes further into the outermost lining of the stomach, called the serosa, it is T3. The tumour is T4 if it goes into another organ, like the large bowel or pancreas that lie next to the stomach. The second part of staging is about spread of the cancer to the lymph glands that lie next to the stomach. This is called the ‘N’ stage of the tumour. The stage is N0 is no lymph glands are involved by cancer. When there is spread to lymph glands, the stage may be N1, N2 or N3, depending on the number of glands that is involved. The third part of staging is to find out if the cancer has spread outside the stomach and the nearby lymph glands. The three common places for spread of stomach cancer are the inner lining of the tummy wall (called the peritoneum), the liver and lymph glands far from stomach. The stage is M0 is there is no sign of spread. If the cancer has spread, the stage is M1. These three parts together make up the TNM stage of cancer. For example, the tumour may be in the muscle layer of the stomach (T2) with no spread to lymph glands (N0) or to distant sites (M0). The TNM stage is expressed as T2N0M0. The cancer stage can be stated as 1, 2, 3 or 4 based on different combination of T and N and M. But, it is more useful to think and talk in terms of TNM for planning treatment. Please note that the staging system that is described here is for carcinomas of the stomach only. Other cancers, like GIST and lymphoma, have separate staging systems. What tests will I need to have to find out the stage of the cancer of my stomach? It is very important to find out the stage of stomach cancer because treatment depends on the stage. The first staging test is a CT scan. The purpose of the CT scan is to find out if the cancer has spread outside the stomach. Also, the CT scan can give valuable information about the location of the tumour in the stomach, the size of the tumour and the depth of penetration into the stomach wall. CT scanning may give all the required information for some patients. Others may need additional tests. EUS (Endoscopic UltraSound) is a special type of endoscopy where an ultrasound scan is done from the inside of the oesophagus. This can give detailed information about the depth of the tumour and involvement of lymph glands alongside the stomach. Some patients may need to have a laparoscopy. 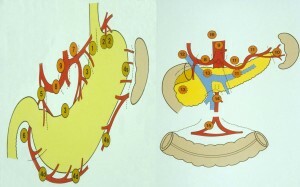 The inside of the tummy is directly seen, and biopsies may be taken. Unlike cancer of the oesophagus, PET scan is not helpful generally for staging stomach cancer. Do I need an operation for the treatment of stomach adenocarcinoma? 1) An operation will not help if the cancer has spread already (stage M1). You will be referred to see an oncologist to discuss chemotherapy. 2) Even if the cancer is at a curable stage, a careful assessment has to be made of the risks of the operation for you, based on your individual fitness and medical problems. The fitness of your heart and lungs may need to checked by a cardiopulmonary exercise (CPX) test. You will be asked to pedal on a special exercise bicycle, with monitoring of your heart and lungs. If the risk of life-threatening complications seems too high, then non-surgical alternatives should be explored. Ultimately, the decision has to be tailor-made for you. If an operation is not felt to be suitable, you can see an oncologist to discuss chemotherapy. 3) An operation may not be needed if the cancer involves only the inner most layers of the wall of the stomach (stage T1). It may be possible to cut out the cancer by endoscopy (passing a flexible telescope-like camera down your mouth). This is called EMR (Endoscopic Mucosal Resection). The cut out cancer is examined in the pathology laboratory. An operation may be recommended after EMR if it appears that the cancer cannot be removed completely. Is there any alternative to an operation for the cure of stomach adenocarcinoma? You should think very carefully about an operation if you have stomach adenocarcinoma at a curable stage. It is almost impossible to cure stomach cancer without an operation. The only exception is if the cancer is at a very early stage and it can be cut out by endoscopy (called Endoscopic Mucosal Resection or EMR). Chemotherapy or radiotherapy cannot cure stomach carcinoma. If I have an operation, will I need chemotherapy also? An operation alone may not be enough to cure stomach cancer. The tumour in the stomach and the surrounding lymph glands are taken out by the operation. But, there is risk that that cancer cells have spread already to other areas. The spread is microscopic and cannot be picked up by the staging tests or by inspection during the operation. These cells can grow after the operation and cause the cancer to come back (called recurrence of cancer). The risk of recurrence can be estimated by the pre-operative staging tests. For example, the risk is increased if the cancer has penetrated all the layers in the wall of the stomach, or if lymph nodes alongside the stomach are involved. Chemotherapy is often given before the operation to bring down the risk of recurrence. Many studies have shown that it is better to give chemotherapy upfront, before the operation rather than to wait until after the operation. You may be given chemotherapy both before and after the operation. Depending on your overall condition, sometimes it may be best to do the operation first. Radiotherapy is not used for the treatment of stomach carcinoma. 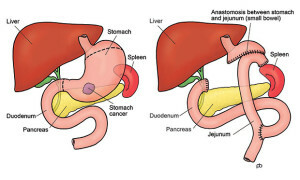 What is involved in an operation for stomach adenocarcinoma? The operation is called a Gastrectomy, which means removal of the stomach. In a Total Gastrectomy, the entire stomach is removed. In a Sub-Total Gastrectomy about four-fifths of the lower stomach is removed. The uppermost part of stomach is preserved. The decision about whether to do total gastrectomy or sub-total gastrectomy depends mainly on the location of the tumour within the stomach and on the size of the tumour. We can make an estimate of the type of operation on the basis of endoscopy and scan findings. But, the final decision has to be made during the operation itself on the basis of the actual condition. It is not enough to remove only the tumour because cancer cells can have spread in the wall of your stomach. Also, it is important to take out lymph glands that lie alongside the stomach because cancer cells may have spread to these glands. This is called lymphadenectomy. Removal of lymph glands that lie immediately next to stomach is called D1 lymphadenectomy. Removal the glands immediately next to the stomach plus the glands that lie along the blood vessels that supply the stomach is called D2 lymphadenectomy. For most patients, a curative operation will be a gastrectomy and a D2 lymphadenectomy. You may hear of it as D2 gastrectomy. After a total gastrectomy, the small bowel is joined to the oesophagus (gullet). After a sub-total gastrectomy the small bowel is joined to small portion of stomach that has been preserved. Gastrectomy operations can be done by keyhole surgery (laparoscopy) or through a long cut on the tummy wall (open surgery). What is the risk that adenocarcinoma of the stomach can come back after an operation? The risk that the cancer will come back (called recurrence of cancer) depends mainly on the final pathological stage of the cancer. The stomach and surrounding gland glands that are removed by surgery are examined in the detail in the pathology laboratory. The final stage takes various features of the cancer into account. How deep does the tumour go into the wall of stomach (T stage)? How many lymph glands are involved by cancer (N stage)? How close that the cancer go to the margin? Cancers at an early stage have better prognosis than advanced cancers. The prognosis is often stated as 5-year survival. This means the number of patients with that stage of cancer who will be alive after 5 years. GIST is a Gastro-Intestinal Stromal Tumour. A GIST is very different from the common type of stomach cancer called adenocarcinoma. GISTs arise from an entirely different cell-type than adenocarcinoma. GISTs vary greatly in aggressiveness. Some GISTs are benign whilst others are malignant. Like adenocarcinoma, the diagnosis of a GIST is made usually by endoscopy. But, because GISTs do not arise from the innermost layer of the stomach, biopsies that are taken at endoscopy usually look normal. What is the treatment for a GIST? Like any cancer, it is very important to do tests for staging before deciding upon treatment. The most important test is a CT scan. An operation to remove the GIST is needed if there is no sign of spread outside the stomach. The operation for GIST is different from an operation for the common type of stomach cancer called adenocarcinoma because GISTs do not spread into lymph vessels and lymph glands. So, it is usually sufficient to remove only the tumour rather than the whole stomach as is done for adenocarcinoma. Most operations for GIST can be done by keyhole surgery and long cuts on the tummy are not needed. If the GIST is large or if it has spread outside the stomach then a special type of medicine called Imanitib (Gleevac®) can be used to shrink the tumour before surgery. Also, some patients may benefit from Imanitib after the operation.